I'm playing a PBEM with 2 friends on the version 1.03.1 of TEAW. I'm in charge of Russia, Czar get in commands after i drop below 75 MN. 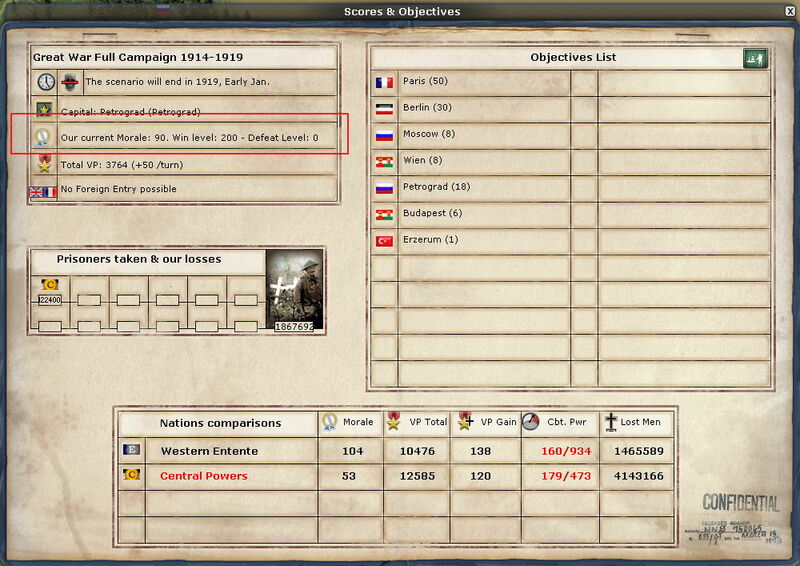 But since destruction of 2 german armies, i get back to 90 MN, but i still get the +1% rebel alignement. It is a known bug ? Cause the tooltip says the +1% rebel alignement occurs only if MN < 75. It is not really a bug. Once the Czar takes command all previous rule are abandoned. You get the continued decline in NM and rebel alignment each turn he is in Command. I'm not sure on how things work in the older version ( 1.03.1) but perhaps it's a timing thing. Are all your images taken from the same turn? For instance, your first image clearly refers to the turn triggering the Czar event, so if your third image comes from the following turn then it's a fair chance that you're still equal to or below 75NM and therefore cop another hit. If your second image is from another turn - by which time you've managed to improve NM - then as you suggest you shouldn't be further penalised. If that's not the case, then maybe you're seeing one of the bugs that was fixed in the 1.04 patch. Durk wrote: It is not really a bug. Once the Czar takes command all previous rule are abandoned. You get the continued decline in NM and rebel alignment each turn he is in Command. If it's not a bug then the tooltip is simply wrong. The tool tip does not take into account the various NM and other factors leading to leadership change, but yes, the literal meaning does not match several game alternative paths.